* Doors, windows, and outbuildings have electronic locks that can only be broken with a Hard ([ppp]) Computers check. * When attempting to find an item that relates to the business, the item's rarity decreases by 2 (in addition to other modifiers). Mental Tools Always count as having the right tools for the job when performing Mechanics checks. Basic Power Spend one FP to cause one vehicle or starship she is engaged with to recover one system strain. Lucy came from a comfortable, hard-working middle class family. Her aptitude with computers and machines was starting to attract attention. Imperial recruiters caught notice, and came to her family home. They promised the stars -- Lucy could serve the Empire and help improve the lives of Imperial citizens across the galaxy! Perhaps it was a growing connection to the Force, but Lucy reacted poorly to the approach. She knew that the Empire would never leave her family alone; "no" is not an answer they would accept. She brought her concerns to her parents, and after a tearful goodbye, they gave her what credits they could, and an heirloom from the Clone Wars, an old holdout blaster. And then Lucy ran. In her attempt to flee by more conventional means, a chance encounter with a freighter captain presented a different route: she signed on with that freighter as an apprentice mechanic. She spent several months aboard, surprising the engineer by rapidly becoming familiar with practically every system. She could practically feel how all of the ship's systems were interconnected; solutions presented themselves almost as if whispered in her ear, and nearly always, the right tool was on hand to effect a repair, even if no tool was on hand but scrap. One unlucky day, though, while she was off-ship, an Imperial customs raid led to her captain's arrest. Now stuck half a galaxy away from home, she ducked back into the crowd. Her fortunes were at a low again, but there were those who were even worse off. Spending her days performing day labor on machines, she spent evenings honing her skills, and helping out people in the slums around her. 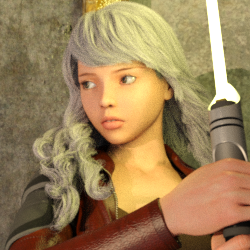 Lucy recognized that something was different about her, but with no context and limited understanding of what the Jedi once were, she hasn't concluded that she is Force Sensitive. **Help the Helpless:** In a galaxy full of momentous events and desperate struggle, it is all too easy to forget the poor, the weak, and the downtrodden. Lucy seeks to give voice to the voiceless, and help those who cannot help themselves. That said, Lucy has survived so far by keeping a sharp eye out. Sometimes, the temptation to keep things at arms length is too great. Lucy is a young human woman of 18 years. She's short (5'1"/155cm), and has long, silvery-blonde hair and grey eyes. She tends to wear practical traveling clothes, notably a heavy brown leather jacket. She's often not far from her spacer's duffel bag.